Up for sale we have a 1970 Chevrolet Chevelle Super Sport. 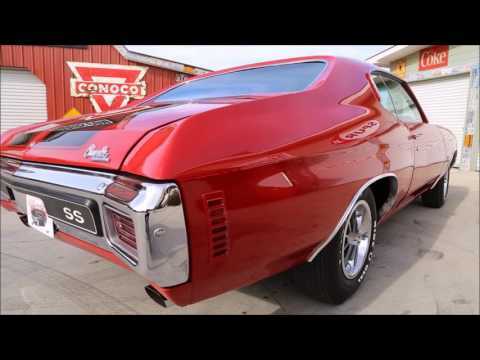 This is one of the nicest Chevelles in the country. We are the third owner, the original owner owned it until 2006. When you walk around this Super Sport you will love what you see. It's laser straight with good gaps and excellent fit of the panels. This '70 is done in the Factory Cranberry Red that's accented by the Black Stripes. At the time of the resto new bumpers were installed along with other chrome. Taking a closer look at the paint you'll see the stripes are laid under the clear. This Chevelle has been buffed and polished to a mirror finish that looks a foot deep. To complete the look, its's sitting on a set of 14x7 Ralleys with Firestone Wide Oval Tires. On the inside, it's done in the factory style and color. It features the factory bench seats that have been recovered. The four speed has the Hurst Shifter and floor boot. Looking at the dash you'll see the SS Round instruments that are working. Also, it has the SS Steering wheel and the factory seat belts. You'll also notice the Headliner, Carpet, and door panels are all in excellent condition as well. Inside the jams are slick and in the trunk looks great with a spare, jack, and a mat. Finally, we will look at the heartbeat of the Chevy. Under the hood, it features the Matching Numbers 454 LS5 Big Block. The intake and carb are date code correct and it has the stock style chrome valve covers. For sound, it has the stock manifolds with 2 ½” Exhaust and Dual chambered mufflers. The engine is mated to the Four Speed M22 Muncie Trans and the 12 Bolt Posi Rear End. This being a Super Sport it has the F41 Suspension along with Power Steering and Power Disc Brakes. When you look under this Chevelle you'll see it's rock solid from the floors to the frame. Also, the fuel tank was replaced along with the fuel and brake lines.